BALTIMORE (WMAR) — A classroom full of students are eager to learn at the Joseph Lee Recreation Center in East Baltimore, but they aren't learning from teachers. "You guys officially know everything about the lungs. You know as much as a lung doctor," said Pulmonary and Critical Care doctor at Johns Hopkins Bayview Panagis Galiatsatos, also know as Dr. G., said. 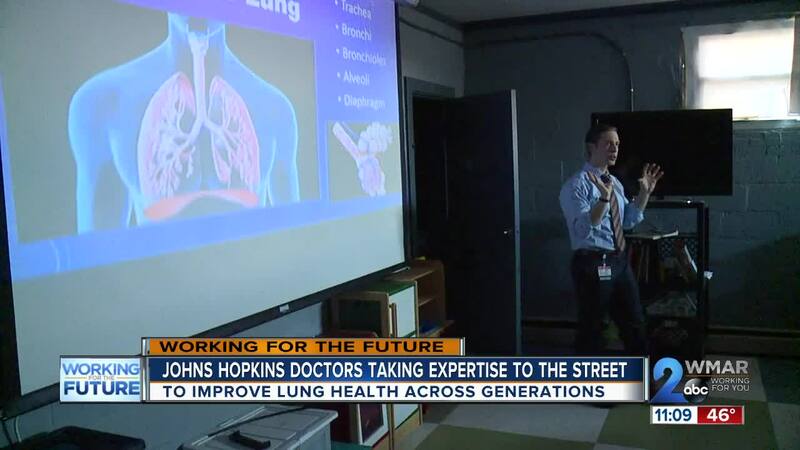 The Johns Hopkins doctors are on a mission to help kids take control of their lung health. They visit rec centers and schools for Lung Health Ambassador programs with the organization, Medicine for the Greater Good. "Teaching kids early about what they can do to stay healthy and to avoid exposures that are harmful like cigarettes and e-cigarettes, the importance of a health environment, importance of air quality," said lung doctor Meredith McCormack. They also teach kids about asthma, one of the main reasons kids stay home form school in the city. "It's a major chronic health problem across the U.S. but especially in Baltimore city, and so most of the kids we interact with here either have asthma or know someone with asthma," McCormack said. The doctors also talk about the harmful affects of smoking and being exposed to secondhand smoke. "They have delayed lung development, so they don't reach the same lung capacity as a child would that was raised in a home without secondhand smoke so we teach them about these affects so they can be empowered to bring that message to their community and families," said McCormack. "It's very cool because it teaches us about life and how we should be healthy and this could be a situation between life and death," said 5th grader Ahmed Nejjari. That's where the second half of their outreach education comes in. "I tell myself every day, I say, 'Girl, you need to stop smoking,' and then I say, 'Well I’m gonna try.' And I try but when the urge hits me, that’s it," said Barbara McDonald. Now 71-years-old, she's been smoking since she was 13. "Now it’s time to quit," said McDonald. She's hopeful this time it will stick because she's got Dr. G in her corner. Galiatsatos is basically making house visits to people who want to quit smoking but don't have access to resources of guidance. "Being a physician, I’ve seen too many of my patients succumb to the consequences of smoking and more importantly, I just feel like the people that continue to smoke are some of the most vulnerable populations in the city and it’s really difficult for them to get resources to quit smoking and so that’s why we are here today," said Galiatsatos. "Getting to learn the patients smoking topography, meaning how they smoke and what time they like to smoke and how often they are smoking, we come up with an individualized plan to give them medications that should be effective for them but emphasize that it takes time." As the director of the new Tobacco Treatment Clinic at Johns Hopkins, Dr. G says he can usually get half the patients off cigarettes by 3 months, and by 6 months, nearly 100 percent have quit. "This is like a doctor coming to your home which is unheard of," said A.I.R.S. social worker Shanda Brown. "This could change lives because a lot of our residents don’t understand that smoking is the number one cause of death." Dr. G also provides accountability. He checks up on people at McCulloh Home every two weeks. "It lets me know that someone's interested in me quitting smoking," McDonald said. Two different approaches, two different generations, one goal: creating a healthy community.